"At eight o'clock the curtain went up and seated on the stage were many citizens of the county and adjoining counties with fiddle and well-rosined bow, ready for the contest, each eager for the start." In 1924, this was Dr. W.H. Johnson's description of the opening of an Old Fiddler's Convention in north Alabama. The phrase "with fiddle and well-rosined bow" captures the enthusiasm with which fiddlers across the state and through the years have thrown themselves into entertaining their communities at barn raisings, Saturday night square dances, Fourth of July barbecues, and other gatherings. Uninterested in the authenticity of their sources, fiddlers have always played music that pleased themselves and their audiences, be it traditional reels and jigs learned from their fathers and mothers, parlor tunes and hymns sung around the piano with their families, or popular tunes from the radio played by request. The quality that unites the eclectic mix of tunes in the fiddlers' repertoire is oldness. The tunes may be ancient, but even if they are not, they are played in a style that makes them sound that way. 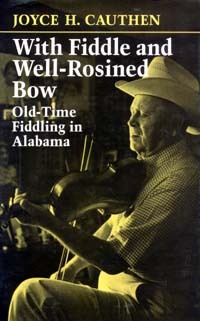 With Fiddle and Well-Rosined Bow traces the fiddle through Alabama history, showing the effects of events, inventions, ethnic groups, and individuals upon fiddlers' styles and repertoires. The book focuses on the "modest masters of fiddle and bow," those fiddlers who were "stars" only to their families and communities, with the fiddlers themselves telling why they learned to play, how they learned without instruction and written music, how they acquired their instruments and their repertoires, and how they were regarded by their communities. Cauthen details the careers of "brag" fiddlers (D. Dix Hollis, Y.Z. Hamilton, Charlie Stripling, "Fiddling" Tom Freeman, "Monkey" Brown, and the Johnson Brothers) whose reputations spread beyond their own communities because they made commercial recordings, won numerous fiddling contests, or performed widely. Described in vivid detail are the types of events fiddlers reigned over, such as old-style square dances and fiddlers' conventions. The book shows conventions held between 1920 and the end of World War II to be popular entertainments vastly different from contemporary fiddlers' contests. With Fiddle and Well-Rosined Bow concludes with the exploration of how, despite much evidence to the contrary, the fiddler acquired the image of a rowdy prankster in league with moonshiners and the devil. AN appendix provides the reader with lists of old-time fiddle tunes commonly played in Alabama and the names of winners of fiddlers' conventions in the state between 1907 and 1945. Joyce H. Cauthen has worked with the Alabama Folklife Association, the Alabama State Council on the Arts, the Birmingham Country Dance Society, and other organizations in a variety of activities celebrating and preserving the old-time musical traditions of the state. She received her B.A. from Texas Christian University and her M.A. from Purdue University and has taught English on the secondary and college levels.